The Camino de Santiago (the Way of St. James) is a large network of ancient pilgrim routes stretching across Europe and concluding at the shrine of St. James the Apostle in Santiago de Compostela in the Spanish province of Galicia. The pilgrimages started very shortly after the believed discovery of the tomb of the Patron Saint of Spain in 814. There are two competing claims regarding James evangelization of the Iberian Peninsula with one, based on the Epistle to the Romans where St. Paul suggests a disciple hadn't visited Spain and the alternative, that after James was martyred in AD 44 his remains were transported back to the land that he had in fact evangelized. Regardless, pilgrims flocked to the site using the Camino de Santiago and Wines of Navarra website, "in 1234 the first of a succession of French monarchs ascended by marriage to the throne of the Kingdom of Navarra, ushering in over three centuries of cultural flowering still evidenced today by the beautiful and well-worn vestiges of the region’s late Romanesque and high Gothic architectural ambition". As a result of these events, French pilgrims and Monarchs desired French wines so that French grape varieties were planted in the province. 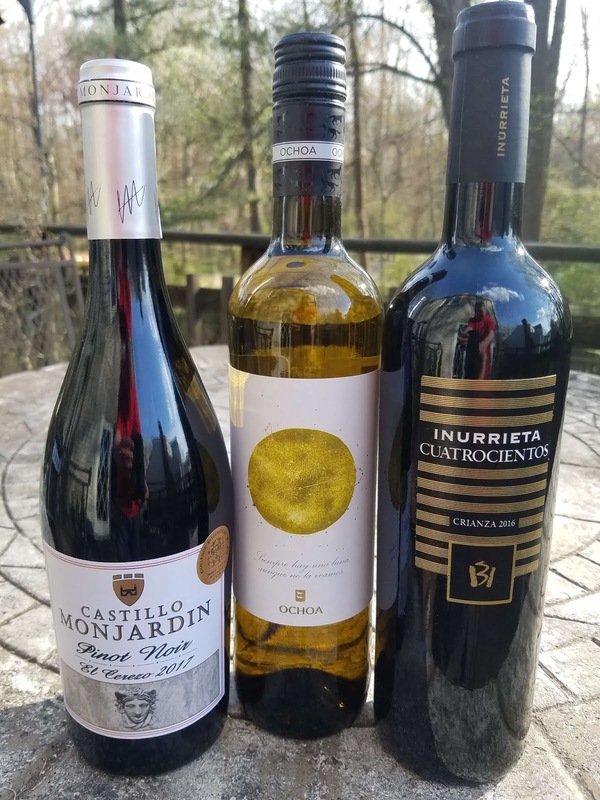 These Cabernet Sauvignon, Merlot, Pinot Noir, Garnacha (Grenache), and Chardonnay vines remained planted among local Tempranillo and Viura vines through throughout the centuries. According to Wine-Searcher.com, "In 1933 the regional Navarra DO was created and its geography is diverse with a number of different features that affect the region's vines and climate. Its proximity to the Bay of Biscay (Atlantic Ocean) in the northwest, the Pyrenees in the northeast and the Ebro River all combine to moderate temperatures created by the effects of the Mediterranean climate. Because of this diversity, five sub-zones were created: Baja Montana in the northeast, Valdizarbe in the north, Tierra Estella in the northeast, Ribera Alta in the center, north of the Ebro, and Ribera Baja in the south below the river. A small section of Navarra is classified as Rioja DOCa (Denominación de Origen Calificada)". Recently I received three wine samples that reflect the abundance of French grape varieties but also the history and geography of the region. Castillo de Monjardin is located in the foothills of the Pyrenées not far from the French border and literally part of the Camino de Santiago as the Castle of Monjardin is a populate hike. The Castle's heritage peaked in the 12th Century but grape growing continued dominated by Chardonnay, Cabernet Sauvignon, Merlot, Garnacha, and Pinot Noir. Bodegas Castillo de Monjardín operates a family estate of 220 Ha of vineyards that aged were planted 15, 30 and 70 years ago. These Tierra Estella situated and Atlantic influenced vineyards reside on sunny slopes at an average altitude of 1800 feet and are cooled by the "Cierzo" wind -- "a strong, dry and usually cold wind that blows from the North or Northwest through the regions of Aragon, La Rioja, and Navarra". 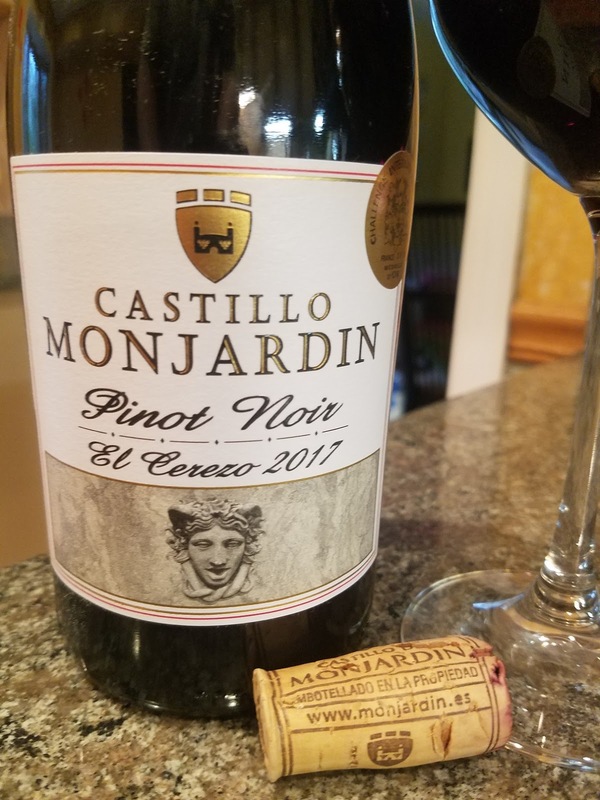 This Pinot Noir is made from grapes harvested from the high altitude and 30-year-old "El Cerezo" vineyard and aged 6 months in oak barriques after fermentation. This process provides slight vanilla and toastiness which are subtle compared to the soft earthy tones and dusty finish. Excellent. 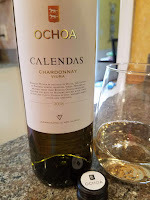 Although the current Bodegas Ochoa operation has "only" been in an operation since 1845, the winery possesses an invoice from 1370 where the residing King requested wine from an Ochoa brand. Not only was its location in Olite, the summer residence of royalty in medieval times but it is also situated in the heart of Navarra in Ribera Alta. This is a continental climate bordered by Atlantic and Mediterranean influences, thus warmer with less rainfall than Tierra Estella, but cooler than the Mediterranean climate to the south. The current winemaker is Adriana Ochoa -- the 6th generation of family members to produce wine. 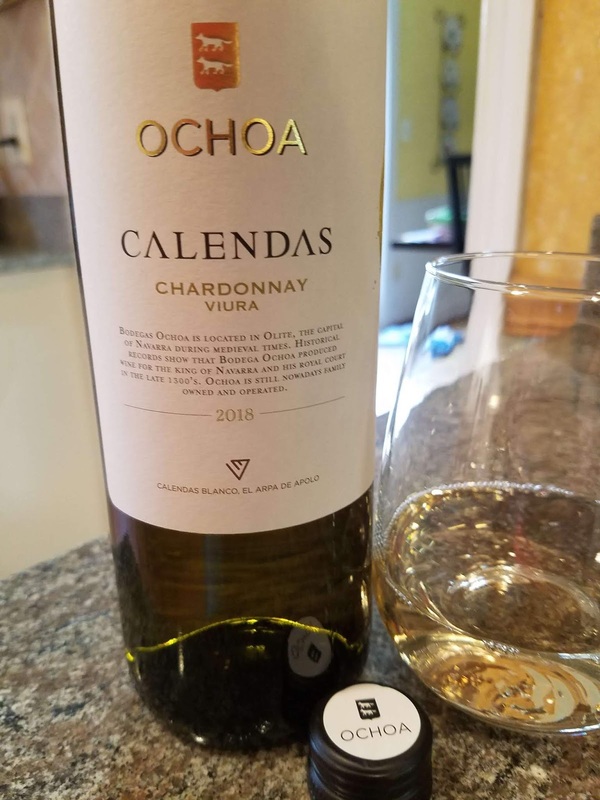 She crafted this 50-50 blend to showcase the liveliness of the Viura and the structure of the Chardonnay. It is delicious. 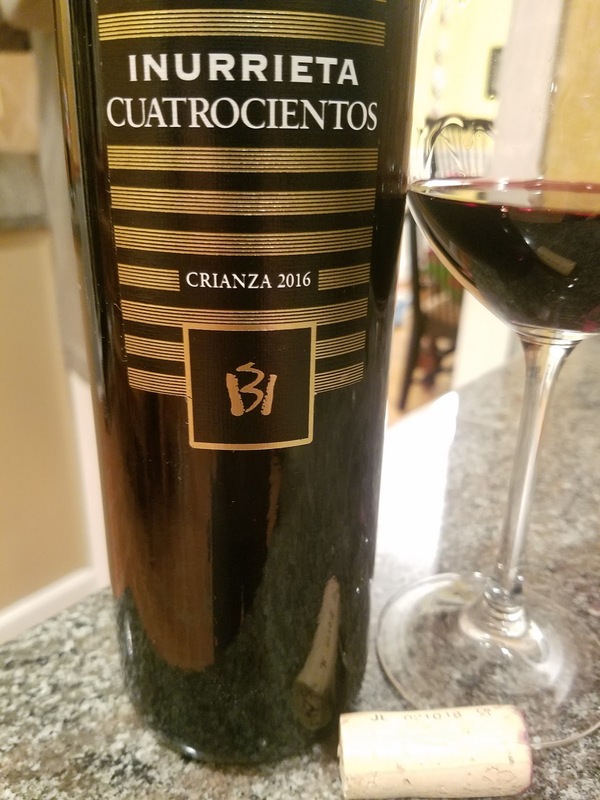 Bodega Inurrieta is also a family-owned company and located in Ribera Alta, but with a little more Mediterranean influences. The name Inurrieta pays tribute to the family name Antoñana and refers to the land where their family grew vines almost sixty years ago. This is a recent endeavor, with the first vines planted in 1999. 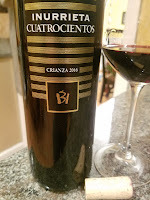 This Crianza wine is a blend of 68% Cabernet Sauvignon, 23% Merlot, 6% Syrah, and 5% Graciano. After fermentation, the blended wine was aged 14 months in French Allier and American oak barrels. The result is a structured wine, medium to full-bodied with noticeable but approachable tannins.